Given how successful Chrono Trigger was, it was a shame that the dream project's once-in-a-lifetime development circumstances seemingly barred any sequels. Of course, Hironobu Sakaguchi and Yuji Horii would go on to continue work on their own respective hit series, and guys like Yoshinori Kitase and Nobuo Uematsu were, first and foremost, members of the Final Fantasy team, so fans would be seeing much more from them. Meanwhile, many of the other core staff members would go on to work on 1998's Xenogears for the Sony PlayStation. Before anybody ever saw Chrono Cross coming, this somewhat under-the-radar release was consequently regarded among fans in the know as the first full-length followup to Chrono Trigger. A cute in-game cameo by none other than Chrono Trigger's Lucca suggested that its creators were approaching it with the same attitude. Like Chrono Trigger, Xenogears was a traditional console JRPG from Square. With no special gameplay hooks or gimmicks (e.g. the real-time adventure of Mana, the nonlinear structure of SaGa, or the turn-based strategy of Front Mission) to distinguish itself, it tread the same territory that was practically owned already by the company's Final Fantasy series. But whereas Chrono Trigger had been promoted as a bigger deal perhaps than any single Final Fantasy, Xenogears was clearly more of a secondary project, handled, not necessarily by a B-team, but by greener staff members who would need to prove themselves this time without a Sakaguchi or Kitase to lead them. The Xenogears team included scenario writer Masato Kato and composer Yasunori Mitsuda, but it really belonged to writer and director Tetsuya Takahashi. It was Takahashi's biggest project yet, as well as his last for Square, as he would subsequently leave to help found Monolith Soft, where several other Xenogears team members would join him in developing Xenosaga. Before that, however, he lent his vision to Square with a game that, while lower-profile, was no less ambitious than a Chrono Trigger or a Final Fantasy VII. Thus, in a year without a numbered Final Fantasy release, fans could still enjoy a Square RPG that boasted comparable length and depth, while also offering an excitingly different aesthetic from some up-and-coming talent. 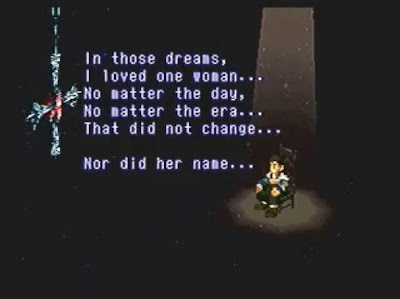 In terms of just story content, Xenogears remains probably the longest game I've ever played. More complex and mature than previous Square titles, it traded the charming and likable personalities of Chrono Trigger for flawed, wounded, and wayward human beings struggling to understand one another. The labyrinthine script ventured into some dark places with these characters afflicted by dissociative disorders, split personalities, and other existential dillemmas. It also featured more twisting threads than the player would ever know what to do with, yet somehow tied them all together in revelatory ways. When a mysterious villain cloaked in black showed up and teased that he knew the orphan protagonist's absent father, the story may have sounded familiar, but the truth that lay in wait some fifty hours later proved devious beyond compare. No, it was not the most profound drama mankind had ever seen. It was still a giant robot story that clearly would not have existed had not Takahashi and crew seen Neon Genesis Evangelion a few years earlier. But it did provide, like Chrono Trigger, a consistently gripping narrative that linked each event to the next with few breaks. Compared to Chrono Trigger's orderliness, however, there was a lawlessness to Xenogears, most evident in its storytelling. The word "epic" is perhaps tossed around too liberally. 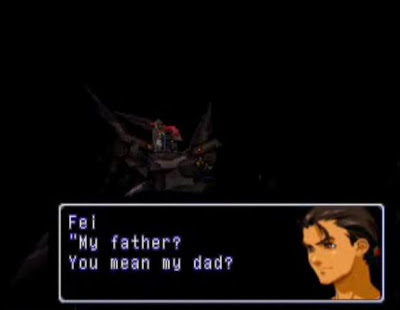 Many JRPGs may be grand in scope and span, but Xenogears was a breed apart, blending science fiction, philosophy, psychoanalysis, metaphysics, and religion in a story that spanned eons of intricately crafted mythology that covered the sci-fi/mystical genesis of mankind, the double-edged emergence of individuality within the human collective, the futility of resistance against gender programming, and the personal tales of transmigratory loves and enmities that endured for ten millennia. The breadth and wholeness of the fiction made it easy for players to immerse themselves in the universe. The concepts proved unsurprisingly too massive to tackle in this one video game, and Takahashi would lament that he was unable to realize his complete vision with Xenogears, hence why he repurposed so many of the themes and assets for Xenosaga. Alas, this would not be the last time Takahashi's reach exceeded his grasp, but there was nevertheless something to be admired in the sheer boldness--a fearsome beauty to the unfettered behemoth that was Xenogears, especially its second disc, where it became almost a different game. In perhaps the most eerily Evangelion-esque turn, due to time or budget cuts, the second half was very much a stripped-down experience. The overworld became seldom seen, dungeons were scarce, and even some major events would be described only through characters' text narration, leading to sudden boss fights with limited context, before cutting back to more lengthy story sequences. 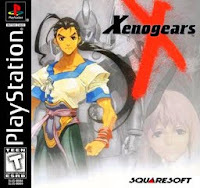 Many critics accused Xenogears, already a dialogue-heavy game, of falling apart in the largely non-interactive second disc, and the developers themselves, citing the production difficulties, confirmed that the game was basically never finished. Rather than wonder what might have been, however, I always felt that whatever constraints forced them to take this direction were really a blessing in disguise. Although I enjoyed the first disc as much as any JRPG I'd played up to that point, it was the second disc that truly made the game remarkable. It offered an intriguing and refreshing departure from the dungeon-boss-event-repeat formula that still forms the basis for virtually every other JRPG, and it also rendered the storyline even more thrillingly unpredictable by defying conventional narrative pacing and structure. Moreover, even back then, I realized that exploration and regular combat were not essential to the narrative, nor did I personally even want them. Taking the opposite visual approach as contemporary Final Fantasy titles, Xenogears placed 2-D sprites on top of simple polygonal environments for a look that was still somewhat evocative of classic 2-D games of previous generations. To better help the player navigate these 3-D towns and dungeons, Square included a rotatable camera and a jump button. The latter added some platforming to the exploration, featured most infamously in Babel Tower, which included a room of about a half-dozen floors of tiny suspended elevators, where a single misstep could mean falling to the bottom to repeat the process. As if that weren't aggravating enough, after every successful landing would be a fixed encounter that you could not escape. 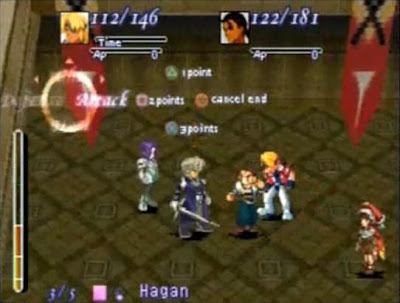 The rest of the game featured random battles, and the already high encounter rate was exacerbated by the fact that battles could trigger while jumping, or even just while rotating the camera. Combat itself was fairly generic turn-based stuff. The distinguishing feature was the "Action Points" system, which allowed characters to take as many actions per turn as their AP permitted. Each party member gained a certain number of AP per round, and you could either spend them immediately on basic attacks, or accumulate them for extended combos for later in the fight. Some of the ideas would be later refined for Chrono Cross and Xenosaga, but, in Xenogears, there was no point to stocking up AP, because all enemies could be defeated more quickly just by blitzing them. Xenogears also included a second combat system for the giant robot "Gears" that characters could ride into battle, provided that the given arena could accomodate them. This was similar to the on-foot combat, but, instead of combos, the Gears had actual special techniques powered by "Fuel" that could only be replenished manually via the "Charge" command. Although the game would usually automatically switch the party into Gears when appropriate, the player was in some areas allowed to fight with mixed parties of humans and Gears. It was quite funny to have the tiny characters fighting alongside gigantic mechs, but Citan with his sword was actually more effective than almost any Gear, and it was pretty sweet watching him cut down enemy Gears and other giant foes. I actually played this game at the same time that I was playing through Final Fantasy VIII. The idea of balancing two console JRPGs at the same time now seems absurd to me, but the idea then was that I would alternate between the two, playing the one as a break from the other, so that neither began to feel like a ball-and-chain commitment. I enjoyed the gameplay systems of FFVIII more, but Xenogears was far and away the more engaging story, and, although I spent roughly equal numbers of hours on each, I ended up finishing it well before I completed FFVIII. Though coming from the house of Final Fantasy and Chrono Trigger, Xenogears was not for everybody. Perhaps the most polarizing JRPG ever created, it was easy enough to play, but, for anybody who thought Final Fantasy VII was pompous, Xenogears took it to another level entirely, its heavy-handed, talky story epitomizing what the mainstream now finds tiresome about the entire JRPG genre. It was a flawed game for sure, but its flaws were the result of its creators trying for too much rather than too little. A more disciplined hand may have been called for, but it inspired awe to observe all that Takahashi and his team laid out there. Pretentious but no pretender, it went places thematically that no games had before and, I dare say, reached further than any game since.